The ongoing adventures of a boy who never grew out of making and playing with plastic model kits (and even some metal ones too). Also a wargamer in search of the perfect set of wargaming rules for WWII Land and 20th Century Naval campaigns. 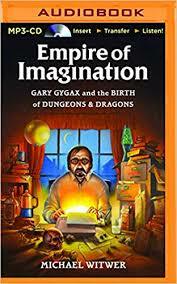 Interestingly Gary Gygax was also an avid board and war gamer. Avalon Hill's Gettysburg was a favourite of his. On the morning of Gencon One he tip-toed across his front room, trying not to tread on sleeping bags of dozing fellow gamers and the 1/1200 scale models from the previous nights Fletcher Pratts sea battles! Respect. In fact Gencon One seemed to be as much wargaming (WWI Dogfights and Napoleonic Sea Fights) as well as Chain-Mail with its Fantasy Supplement! Nice one, I shall have to gt this from Audible. We use to play a lot of AD&D back n the 80's, good memories. Though I was mainly the DM for the VAST majority of games as I had the better 'gaming vision'. I've still got loads of the original modules stored away. April Fool News ... er no "My Mistake"
Zardoz the Magnificent's Dungeons and/or Dragons Super Show! Echoes of a Forgotten Age . . .
What's On The Painting Desk? "This is grapeshot. This is what it does." Pacific '44+ according to Enfield Gamers! Lead Poisoning - One miniature at a time !! "A History of the Late Wars in Euratia..."
Scullmeister's dispatches from the West. ERM (East Riding Miniatures) "Platoon 20"
Urban Operations - Modern Tactical Level Board Game .. and .. Last Game out of Europe before Brexit? Please note that I make no representations or warranties regarding any advertisements, links or other material presented on this blog. Please note that I make no representations or warranties regarding any advertisements, links or oth. Simple theme. Powered by Blogger.